A couple years back, Oprah and her bff Gayle made a cross-country road trip together, stopping at various towns and landmarks along the way. One city the Royal O decided to grace with her presence with was my hometown of Wichita, Kansas. Now, Queen O didn't bother to stop to see our incredible local art scene, hear local music, sample amazing food from one of the hundreds of locally-owned restaurants, or shop at our beautiful shopping centers. Of course not. When she came through good 'ole 'ta town, she did the logical thing and ... went to a garage sale. Apparently she'd never experienced one before and "heard this is what ya'll do around these parts for fun." Well, Queen O, we certainly do! 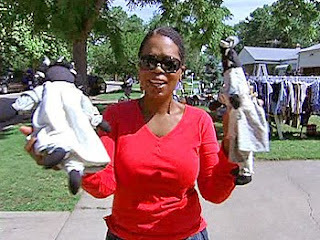 Now, there are plenty of other incredible things to do in Wichita, so I thought Oprah might want to stop for some other kind of entertainment. But maybe she didn't have such a bad idea, because (all joking aside) I do love a good garage sale. And we do have a lot of them "around these parts." In fact, I had one of my own just a few weeks ago. Actually, we had the biggest garage sale I've ever seen! It was about five families combining their junk and hoping to make a few bucks. We had it at my friend Gail's house, with a giant yard, large circle drive, long side drive and two-car garage ... all covered/stuffed/layered with junk...errr...treasures...for sale. I wish the pictures did it justice. I made a whopping $213, but more than anything it was a really fun time. I got to hang out with my mama (aka my favorite person ever!) and the ladies we co-saled with were fabulous! We had so much fun haggling, organizing and trying to speak Spanish/Chinese/who knows what else from dawn til dusk. Yay for great memories! Now, as anyone in Wichita knows, Thursdays at the crack of dawn during the spring mean garage sales galore. And I have been missing out! I haven't managed to hit too many this season and I'm raring to go! The trouble is I have to roll out super early, which is not ever my strongest suit. But tomorrow is garage sale day so I am bound and determined to go treasure hunting before work. Wish me luck and I'll keep you posted on what I find. Just a disclaimer that it may not be much because I have about $6 to my name currently ... but hey, that can go a long way at a Wichita garage sale! What have you all found at sales? Any luck? We HAVE to go garage sale shopping asap! I mean... ASAP! And SUCCESSFULLY find something good! Umm... loved your guilty pleasures - bahaha! The cheezits are a Court staple! And a big heck yes to trashy magazines at B&N next weekend! Love you! PS- I hope to report some awesome garage sale finds in the big KC super soon! Aww....you're one of my favorite people ever as well! Oh the fun we had!